Our planet’s beauty and fragility can never be understated. 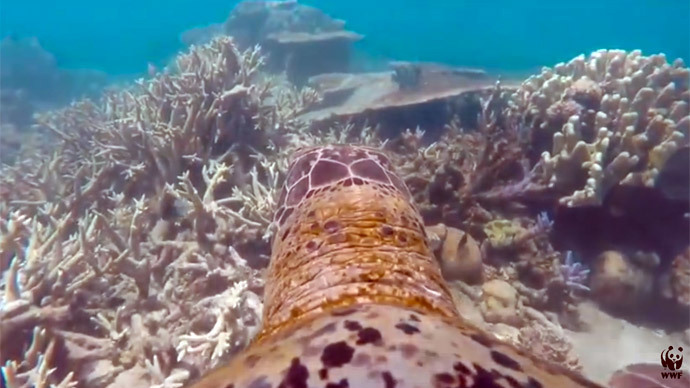 So, scientists with a GoPro teamed up with some turtles to take the viewer on a tour of the Great Barrier Reef – the endangered paradise, as seen from the point of view of its inhabitants. Turtles are proving invaluable research companions in WWF’s quest to learn as much as they can about the disappearing underwater landscape. The organization has been tagging green turtles, the ones that grow to weigh up to 400 pounds and are the size of a small child. To help them get a good look at what is going on underneath, they’ve strapped a GoPro to a tagged turtle’s shell, and the fun began. Underwater views of exquisite beauty open up as the animal swims past the endangered coral reefs and exotically-colored fish and marine life. The footage lasted for about 15 minutes, before the turtle shook the camera off its shell and swam off, with the divers later recovering the footage off of the ocean floor. WWF hopes that the UN body will maintain pressure on the Australian government to preserve the rapidly disappearing reef and restore it to health. It says more than a half-million of the organization’s supporters from 117 countries have joined the global call. The situation is dire. Half of the natural reserve has died in the last 30 years, due to climate change , and the UNESCO World Heritage Committee will not recognize the area as “in danger.” It has acknowledged, however, that the 1,430-mile stretch off the Australian coast needs to be protected. Pollution, ocean warming and climate change are causing irreversible change. A slew of nearby projects in recent years have also been threatening the site.